Grainger have built a 6ft fence around the Green Gap The boards on New Road block our precious views but they reveal much. They reveal Grainger PLC’s corporate malice and spite. They reveal it’s executives distain for our community. They reveal how speculator’s motives are base and malevolent. Grainger’s Executive Director Nick Jopling slyly claims SODC asked them to ‘secure the land to prevent nuisance’. SODC so far deny all knowledge of this. Through this cynical and disingenuous smoke screen one thing is clear: speculators cannot be trusted. Grainger’s friends Catesby and Greenlight face SODC’s Planning Committee on Wednesday 18th October. Come along to Didcot Civic Hall at 6pm. 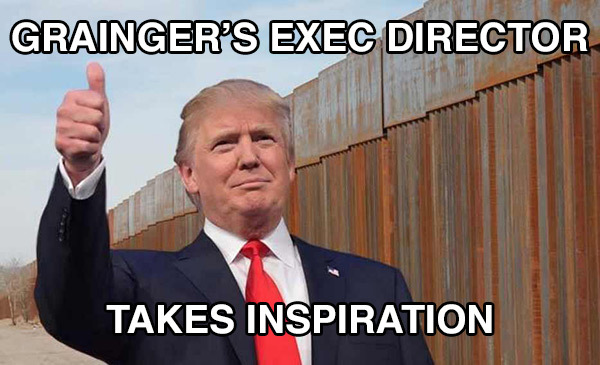 Let’s ‘build a wall’ too. A wall of opposition to speculators treating us with contempt. This entry was posted in Uncategorised on 18th October 2017 by Mind the Green Gap.